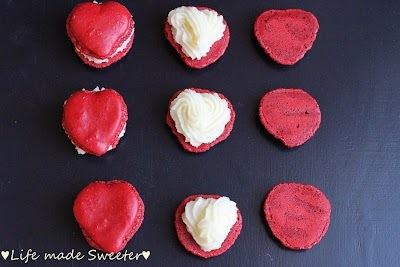 Impress your Valentine with these Red Velvet Heart Shaped Macarons filled with cream cheese frosting. The melt in your mouth texture make them a perfect treat any time of year. 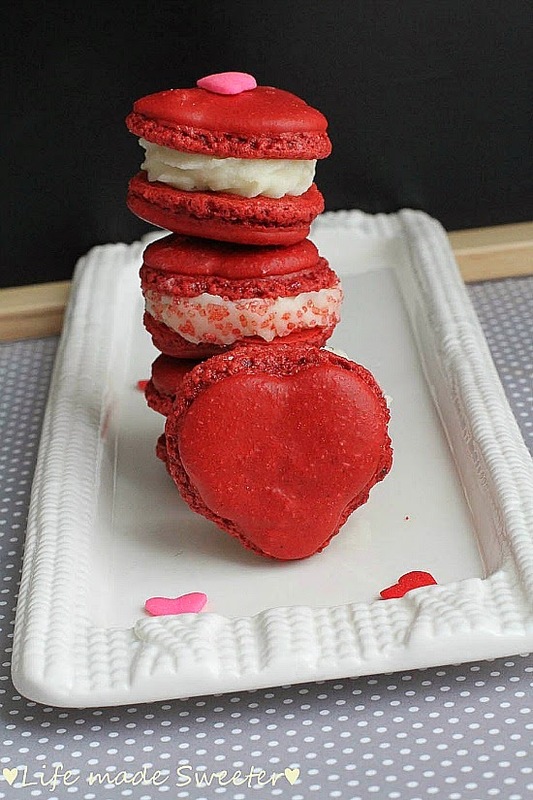 If you are still looking for ideas on what to make for Valentine’s Day, these Red Velvet Macarons are the perfect way to ask that special someone to be your Valentine. Nothing says “I ♥ you” more than heart-shaped cookies. 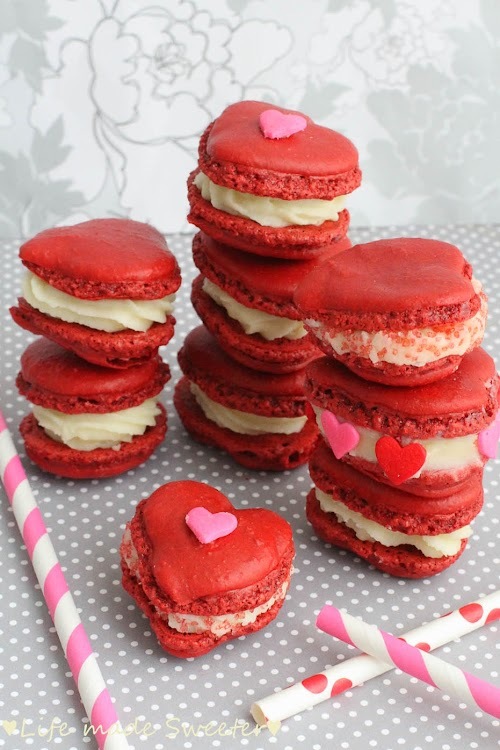 Especially when the cookies are macarons. These Red Velvet Macarons start with the classic crunchy outer shell and a chewy melt in the mouth texture inside. Just like the Red Velvet cake, there is a hint of cocoa powder to give them the right touch of chocolate flavor and a cream cheese buttercream makes the perfect filling. These cute little cookies definitely take some practice to get right. I have a love-hate relationship with these little guys since I started making them last spring after Love and Olive Oil’s Macaron Kitchen Challenge. If you have never made macarons before, Brave Tart and Food Nouveau are both excellent sites to start off with and have great step-by-step tutorials. 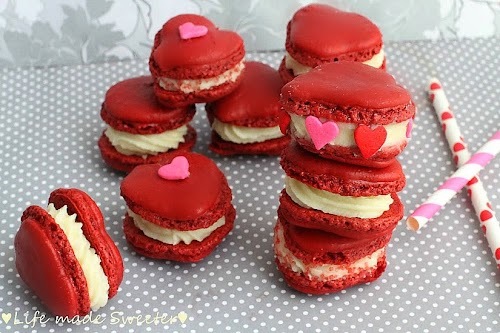 Be sure to have a kitchen food scale when following any macaron recipe as it ensures the right amount of ingredients. 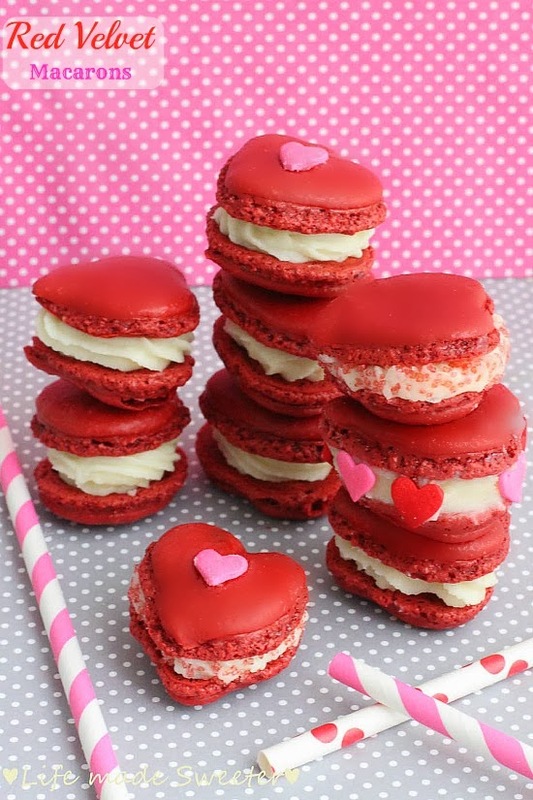 Macarons usually taste best the next day after they have been filled so that the flavors have had a chance to meld together. 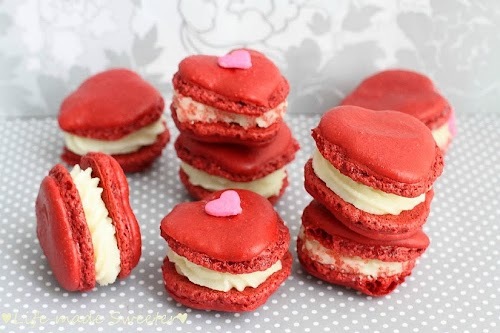 Even though they take time and effort to get right, they are worth every single bite and the perfect treat to show that special someone how much they mean to you. 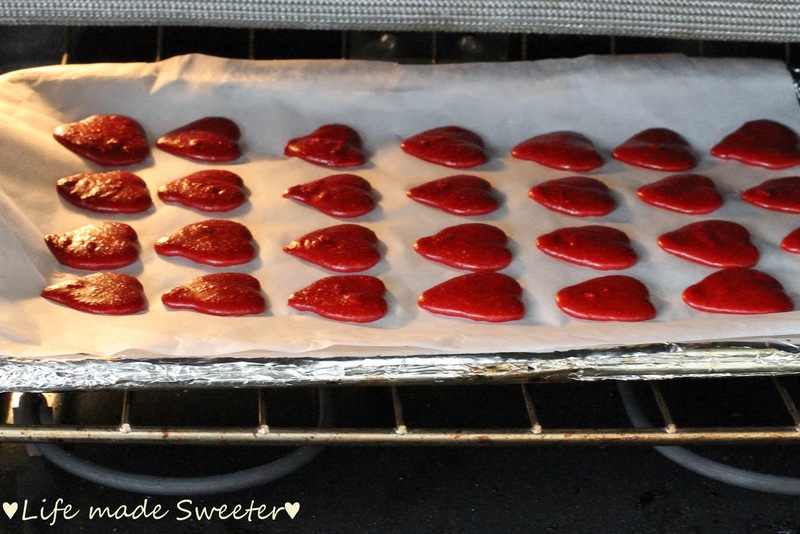 Line two large baking sheets with parchment paper or a silicone mat - if using a template, slide underneath parchment paper before piping. Set aside. In a medium bowl sift together almond meal, powdered sugar and cocoa powder. With a stand mixer or hand mixer, whisk egg whites at medium speed until the egg whites begin to foam. Slowly sprinkle in superfine sugar. Slowly increase speed to medium-high and beat until a firm meringue forms with stiff glossy peaks. Beat in the vanilla extract and red food coloring. Use a rubber spatula, gently fold the almond meal mixture into the egg whites. 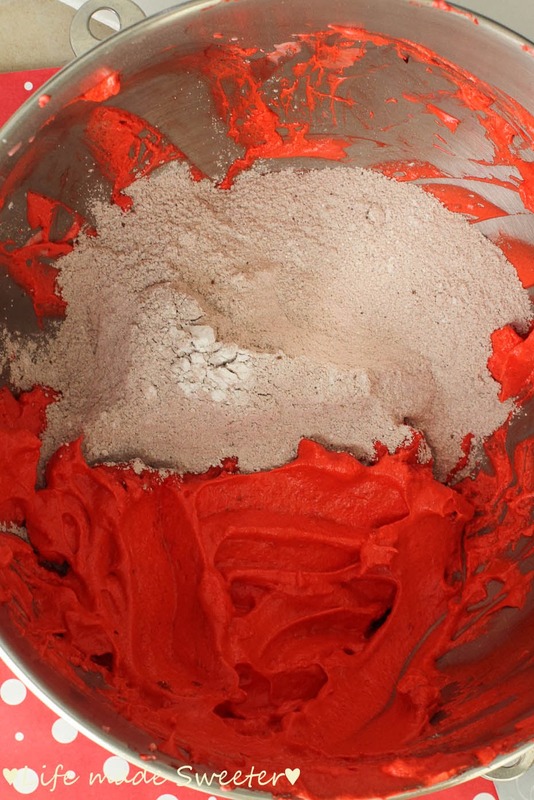 Only fold the batter in one direction by sliding the spatula into the center of the batter, then lifting it up and letting the batter fall back onto itself. It generally takes about 40-45 strokes to work the batter, but this number isn’t as important as how the batter looks. 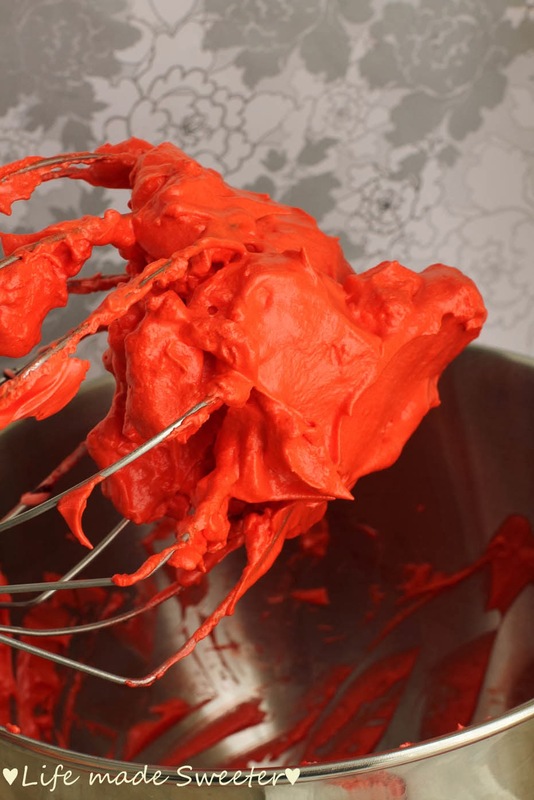 The batter is ready to pipe when it has a smooth, shiny surface and flows like lava in one large ribbon off the spatula. 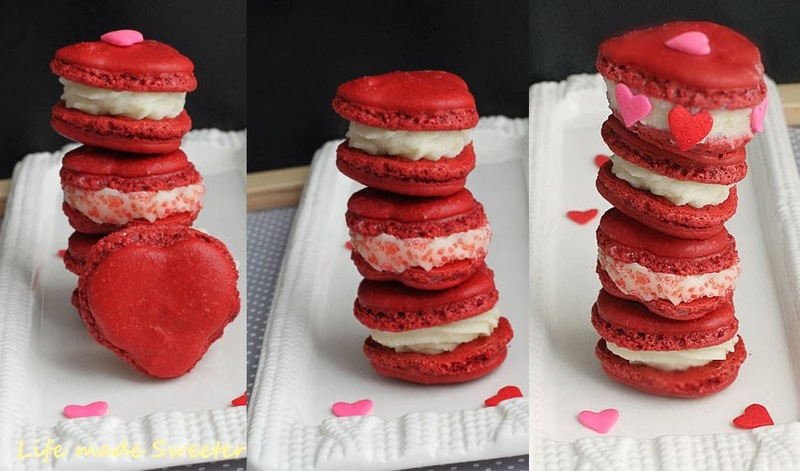 An easy way to tell if the batter is done, use a rubber spatula to lift and drop the batter onto itself - if the ribbon gradually disappears into the batter within 30 seconds, it is ready. If not, keep folding a bit longer. 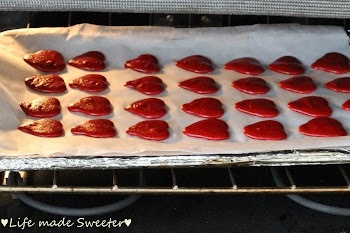 Pipe hearts or rounds onto prepared baking sheets following the templates if using them, leaving space between the macarons to allow batter to spread. 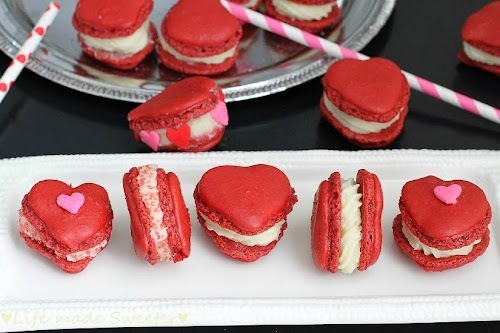 While you are waiting, preheat oven to 325 F. When macarons are dry to the touch, lower the oven temperature to 295 F and bake *both trays at same time (*if your oven has room, otherwise bake one at a time) for 14-16 minutes, rotating trays once. 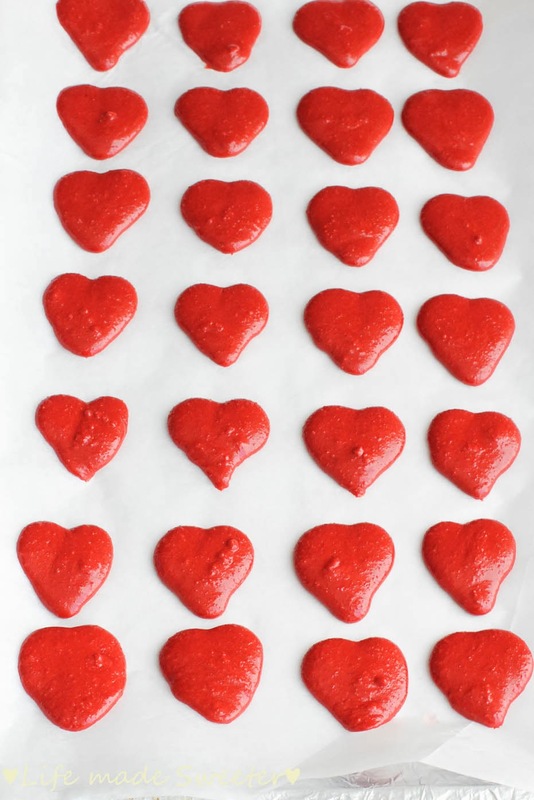 Let macarons cool completely on parchment paper before removing. In the bowl of your stand mixer with the paddle attachment, cream butter until lightened up, for about 3 minutes. Add cream cheese 1 cube at a time and beat until fluffy and incorporated. Add the remaining ingredients and beat on high for 3-4 minutes. 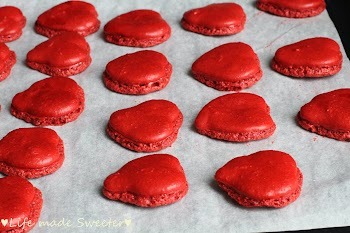 Transfer to a pastry bag for piping or you can simply use a butter knife or spoon to fill the macarons. Pipe filling onto a macaron shell and sandwich together with a second matched up shell. Repeat until all shells are used. Store in an airtight container, in the refrigerator, for 24 hours.